Now that my son is in school, I appreciate summer a little more! We have really enjoyed the relaxing mornings before we head out to swim team and lessons. The kids love pancakes but I usually make waffles (less babysitting involved I think) but their extra nice request was too hard to resist the other morning. I had a clearanced container of ricotta in the fridge and remembered hearing about ricotta pancakes once so to Google I happily went. 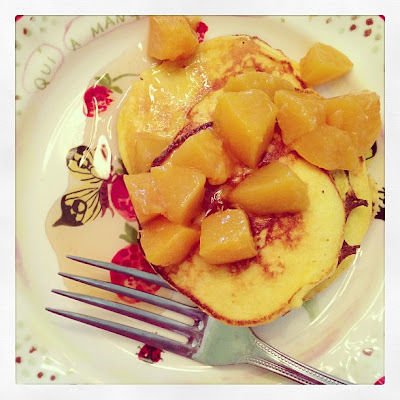 Smitten Kitchen never disappoints (she has a lovely new cookbook too) and although I didn't make the apples she suggested for her lemon ricotta pancakes, some yummy canned peaches from last fall were perfect with our favorite homemade maple syrup. Honestly, though, these tasted amazing fresh off the stove with a little butter on top. I hate lumpy pancakes (though I probably deserve them using Bisquick!) Because these pancakes are mostly ricotta and eggs, there's no lumps- just soft, tender pancakes to melt in your mouth. Next time I'll double the recipe because these were all gone before the griddle cooled with only my little man, baby strawberry and I eating them. Servings: Makes about twelve 3- to 4-inch pancakes. Separate the eggs and set aside the whites. In a bowl whisk together the egg YOLKS, ricotta, sugar, and zest. Lightly stir in the flour until barely combined. In a bowl with an electric mixer beat the egg whites with a pinch of salt until they hold stiff peaks. Whisk in a quarter of the whites then fold the rest in gently. Cook the pancakes over medium heat on a griddle of flat pan brushed with butter for 1 to 2 minutes on each side, or until they are golden. The recipe will yield about a dozen 1/4 cup sized pancakes. Transfer the pancakes as they are cooked to a heatproof platter and keep them warm in a 200°F oven (or eat them hot off the pan with a little fresh butter!) Try fresh fruit or maple syrup on top. Well, I said I would be on to post about the trifle I made but writing a full on recipe and post seems about as possible as well, I don't know, most things are a little difficult right now with a cute little monkey in my arms. Getting to swim team on time is pretty impressive for now (we're 3/4 for on time, not too shabby!) I've sat down and worked on my post 15 minutes at a time for a few times but it's not finished so I thought I'd share a few things instead. For the locals, there's a new place to get your carb fix in downtown Mesa- Proof Artisan Breads. The pain au chocolat is to die for and I'm looking forward to trying some of his fancy breads. Mr. Carbohydrate was even impressed and asked when I was going to bring those home instead of gorgeous chocolate pastries he can't eat. Check it out if you're close by. I think I might have been the last person to notice this salad dressing but I thought I'd pass it along just in case. I love making my own salad dressings and usually do (maybe that's why I didn't know about the Olive Garden dressing?) But I was looking for a dressing we had had at a party and couldn't resist this $3 bottle of deliciousness. It tastes like the real deal- much more than all the copy cat Olive Garden salad dressing recipes I've seen and tried on Pinterest. I'm not breaking up with homemade salad dressing (I have lots of great ideas on my board here) but I'm certainly going to buy another bottle of this when it runs out. I found mine at Walmart, $3 well spent! The last thing I'm nibbling on most of the time is this cute girl. I think I'm going to call her baby Rosebud for now. She's adorable and delicious and about to wake up from her nap so it's time to cut this super eloquent blog post off. Have you been eating anything amazing lately? Is there a salad dressing that I should have tried by now? Do tell!